Leak detection with mass flow sensors can be used for leak tests of parts with big volume and small leakages. Typical test parts are tanks, reservoirs and coolers. 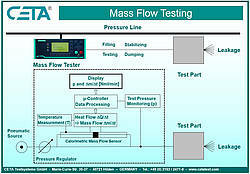 In mass flow testers calorimetric mass flow sensors are frequently used. The air flow from the regulated pneumatic source is divided into two laminar flows (the main flow and the test flow). The test flow is conducted to the sensor. The mass flow sensor has two heated temperature sensors. The air, which passes the sensor, transports heat energy from one sensor to the other one. Both sensors are heated, therefore the transportation of heat energy causes a temperature difference. This results in a change of the resistance of the temperature sensitive sensors. The mass flow is directly proportional to the temperature difference. By an amplifier circuit the measurement data are processed. A complete measurement cycle consists of the phases filling, stabilising, testing and dumping (similar to the phases in leak testing). Due to the integrated temperature sensor the mass flow values are temperature compensated. The mass flow is displayed in the unit Norm-ml/min. 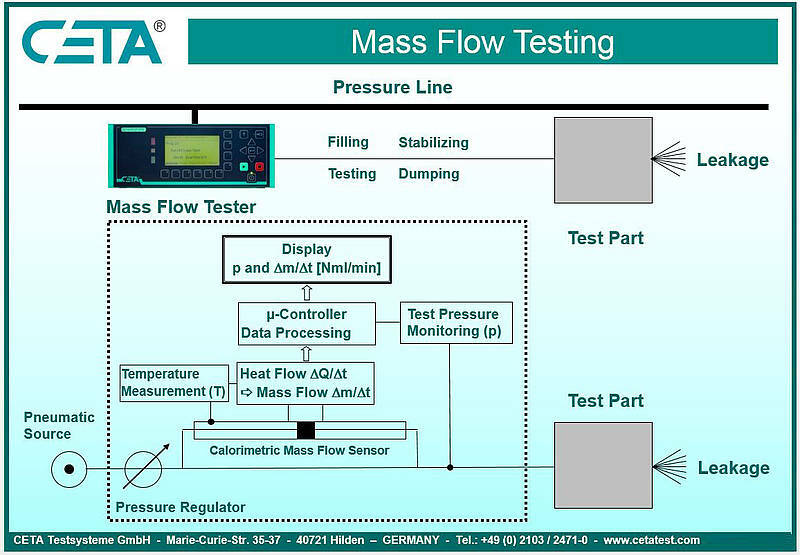 In a mass flow test the leak rate is measured in a direct way. This is an important advantage compared to the measurement of the temporal decay in leak test methods.